CARMEL, Calif. – August 15, 2018 – Vidita Singh, an acclaimed automotive artist and guest of the Automotive Fine Arts Society (AFAS), will debut several original paintings at the group’s exhibit and reception during the Pebble Beach Concours d’Elegance on Sunday, August 26th in Carmel, California. This is the 21st year that Lincoln Motor Company will sponsor the AFAS exhibit on the Pebble Beach show field. 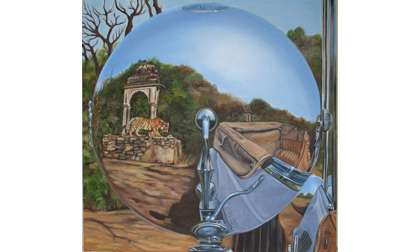 Vidita Singh is one of the first established automotive artists in India. Brought up in a family of automotive enthusiasts – her grandfather imported many cars, while her father is a pioneer in the field of automotive restoration and a published historian – it was almost inevitable that automobiles would be reflected in Vidita’s art. Vidita has managed to portray automobiles and their special relationship with India in a manner that has earned her international acclaim. Accentuating the novelty of automobiles in the bygone era – as well as the artistic and mechanical masterpieces they are today – is her passion. Vidita works in a range of mediums, including oils, charcoals and watercolors. She sees these traditional mediums providing her artwork with an Old World charm, as – of course – does her subject matter. Vidita’s work has been featured on television, such as the BBC’s Wheels, and has also been featured in automotive and lifestyle magazines, including Hello Magazine India, BBC Top Gear, Auto India, and Auto Car. She has produced solo exhibitions in New Delhi, Mumbai, Hyderabad, Hong Kong, and has been part of several exhibitions, including the Cartier Concours d’Elegance.